Good morning ageing, old, infirm, possibly deluded, but still very keen BRATS. Now is the time to embrace Spring, remember which is your right from left shoe, and demonstrate your undoubted pace. If you are still reading this and you are under 35, then you need to get out more. Yes, Masters National Road Relay Champs are here. Saturday 18 May at the usual Sutton Park spot. As you are unlikely to recall 12 months previous, here is how it works. There are teams for M35+ x6 legs; M45+ x4 legs, M55+ x3 legs, M65+ x 3 legs, M75+ x3 legs ! You can run for a younger team, and we can enter as many teams as we wish to pay for. Our priority is to populate with the quickest athletes, our team who have the best opportunity of a high finish or medal; with the exception of prioritising any individual athlete in an older category who has a real chance of an individual top three finish and national medal. Our strongest category is M35. If anyone wants to go for an individual medal in an older category let me know or ask my advice. In 2018 BRAT M35 finished 6th. 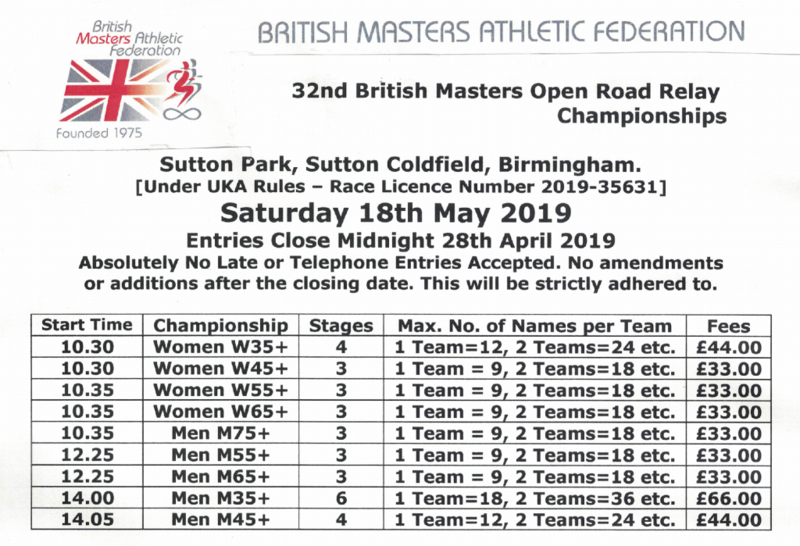 I need your reply by 26th April latest, whether you are a definite, probable, possible, EA number, DOB, current 5k or 10k time (time only if you didn’t race at the 12 stage), any requests(not encouraged !). Communication via email please. Also available by phone for any questions. All legs should be 3 miles or a few yards short, but not mentioned on the prospectus. Note race times as follows.